For Last years words belongs to last year Language. and Next year words await another voice. and to make an end is to make a beginning. Happy New Year .. 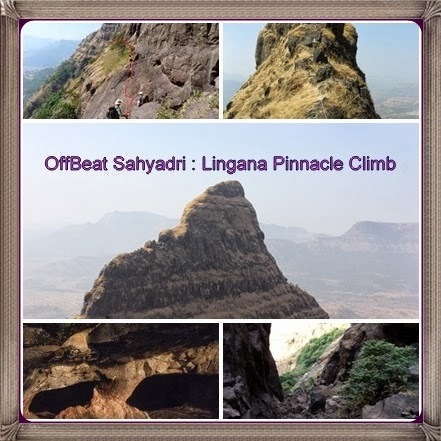 So come and joins us to begin 2014 with Lingana climb ……..
Dear OffBeaters , We invite you for trek to Lingana Base decend down boryatachi nal and Climb to Lingana pinnacle on 4th & 5th January 2014. Lingana fort was built by Shivaji in 1648 to secure central Konkan against the Sidis. Under the Marathas, Lingana was used as a penal settlement. The prisoners were confined to rock dungeons with one dungeon holding 50 prisoners. Lingana was captured by a Colonel Prother in 1818 and destroyed it so that no one capture it back and stay on it. Thereafter the plight of this great monument has become sad. Today it is a attraction for rock – climbers. 11.30 am : Start towards Private Vehicle. 5.00 noon : Reach village harpud/mohri.singapore/varoti. 5.15 pm start trek to railing pleateau. 06.00 pm : Reach railing pleateau and , retire for the day. 11.00 am Reach Top of Lingana. 2.00 pm : Reach to cave and have lunch. 5.00 pm : Reach back to base. 6.00 pm : Railing Pleateau. 7.00 pm : Return journey starts. Note : Above mention Itinerary cannot be confirmed as its technical climb trek , time estimation depend on individual effort , stamina , capability and capacity . Transporation by Private Vehicle Dadar to Dadar. * Saturday Lunch , Please carry . Please go through the Rules and Regulations before registration. Registrations through phone calls only. A batch of 15 enthusiasts only. Entry on first come first basis. Register soon to avoid disappointment. Wear comfortable closed neck casual cotton top and stretchable or comfort fit cotton trousers.